We had an impromptu tasting of American-made absinthes the other night. Who would have thought just a couple of years ago that we could say actually say that? 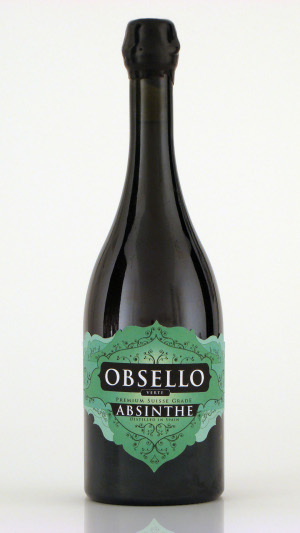 And not sure absinthe available here in the States, but honest-to-goodness verte absinthe made in the goold ol' US of A? The aroma was very distinctive and very promising. A heady mix of scents really came on nicely after we opened up the sleek bottle. The green color was a little pale, but still quite appealing in the glass. As has become our custom, the first drink was sans sugar. We also tried not to put too much water in it, as it has a relatively low alcohol at "only" 60%. The louche however was quite disappointing. Only a slight cloudiness followed and it never really got that thick. Even at its fullest point, the glass was still not completely a nice opaque opaline. And drinking was also a little disappointing, as the heady aroma did not really lead up to a real outstanding taste. It was a solid yet uninspiring taste. Nothing really stood out and there was no special tingle on the tongue either. A good, not great, absinthe. 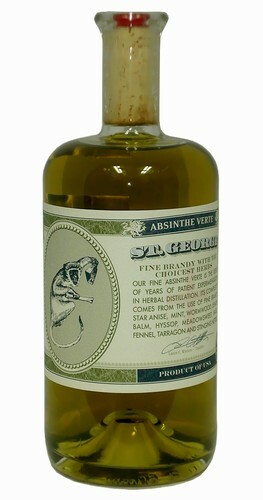 We next tried St. George Absinthe Verte, which has been around since the wine trip to California last summer. We have had it a couple of times and it has really begun to grow on us. The color in the bottle is a little strange, sort of a greenish tinged gold, but it louches up very nicely. Again, a little on the low side on alcohol at 60%, so we keep it pretty strong and have been sticking to no sugar with it as well. There's a real nice tingle on the tongue and the varied tastes hinted at by the unusual color are carried through. It's a very nice absinthe and one we pull out often these days. So the St. George remains our favorite native absinthe, although we have some hopes for SirÃ¨ne, as its initial impressions are very much like we remember ours for St. George. It is certainly good enough for us to continue to experiment with its recipe! DrinkUpNY.com has two more we haven't tried yet - Leopold Bros. Absinthe Verte (made in Colorado) and Gwydion Stone's very own Marteau Absinthe de la Belle Epoque, from House Spirits Distillery in Portland Oregon. Also coming up in the near future is Vieux Carre from Philadelphia. One of the first absinthe brands to finally crash the US market is a new one, formulated by one of the leaders of today's absinthe community, T..A. Breaux. Called lucid(sic) Absinthe SupÃ©rieure, it is imported by Viridian Spirits and has quite the slick web site. We purchased a bottle at the local liquor store (be still our beating hearts!) for about US$65, not necessarily an impulse buy price to be sure. We have had a couple of sessions with lucid and these are our impressions. The bottle is pretty striking, although to these conservative eyes, it brings to mind the story of the Mexican beer that first had the bottle designed and then the beer to fill was sought out. 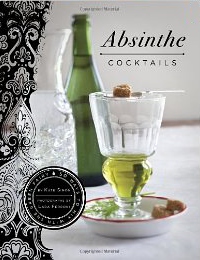 It seems to draw too much attention to the overhyped "mystery" of absinthe, but hey, we'll let it go, I guess. The initial aroma of lucid is rather tame, an indicator of things to come. It certainly smells of anise and other herbs, but in a restrained manner, like it is afraid to scare you away. Pouring it into a glass confirms this shy, retiring mannerism, as the color is equally restrained, being a light pale green. While certainly absinthe, its affect on the eyes and nose belie the aggressive stance hinted at by the bottle. The louche is good, with the final color being, again, very pale, a white with emerald hints. It does release more of that wonderful absinthe fragrance we've all come to enjoy. Even now, many tasting sessions later, we still get an almost Pavlovian reaction to the redolence of absinthe, even one as quiet as we get from the lucid. And drinking lucid re-emphasizes the laid back nature of its recipe. Perhaps aiming to not scare off the nearly virgin American palette, lucid is an easy on the tongue, relatively low alcohol (62%) verte absinthe. We have been drinking it with one cube of sugar, but our next glass perhaps should be sans sugar, to give the taste a chance to stand out more. As it is, a pleasant if not particularly outstanding drink. A ground breaking liquor in its own right, Viridian deserves kudos for creating a good absinthe aimed squarely at the American market. A solid product, creatively marketed, lucid should go a long way towards easing fears of the "devil in a bottle". But I don't think we are being absinthe snobs here at InAbsinthia when we say that it isn't a specially challenging absinthe, with its pretty laid back nature. But that is, we believe, its destiny and, as such, it does a good job. We will have to try it without the sugar to get more of its taste, but I don't think it will be leaping to the fore of our liquor shelf. Our first tasting of the latest LdF shipment was a resounding success. 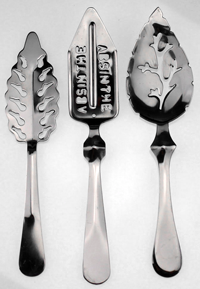 Each of the three absinthes we tried exhibited remarkable character, as well as showing off what a wide range of taste sensations absinthe can bring you. From verte to blanche, these absinthes were winners! First up was the Montmartre. Some of us had sampled this one before, while it was a first tasting for others. It is certainly a very spicy absinthe, with the most vigorous palate of all the absinthes we've tried here. The louche was very nice and finished up in a smooth, green color. Full of scents and tastes, including an almost cinnamon-like "sting" to the tongue, Montmartre should prove to be a long time favorite here at InAbsinthia. It's unique spicy character will be too much for some, though. Next we went with the Eichelberger. Perhaps because it followed the Montmartre, the "Ike" seemed a little quiet, not really showing much to either the nose or the tongue. Louching was nice, although in keeping with its quiet nature, the color was a bit faded. Nice on the tongue, but a little weak tasting. Not a very special absinthe, but a very nice one nonetheless. And we finished the evening with La Ptite, the first genuine Swiss La Bleu poured here. We have had the Blanchette, which is a Jade blanche. Both of these clear absinthes have a very strong anise (licorice) flavor to them, but the La Ptite tasted much more sophisticated than the Blanchette. A truly beautiful louche ended in a very pretty, opal, milky glassful. In the mouth, the "milky" comparison continued, with a creamy, almost oily (in a good way) feel. A very thick tasting absinthe, one with real body and character. A truly special absinthe, and one that will drive us to continue our Swiss La Bleu explorations! All in all, a very successful tasting. Each of the three brought something special to the tongue, with the Montmartre standing out for its spiciness and the La Ptite bring us Swiss La Bleu excellence. The Eichelberger has its own niche, as a very good "value" absinthe with a pleasant taste. While on a business trip to France, a well meaning relative purchased a bottle of Absente for me as a Christmas present. We had a glass after our dinner and drinks (but before I had a chance to closely inspect the bottle). My recollection is that the taste was OK (it tasted like absinthe) but it was a little plain compared to the other absinthes I have tasted. It was only after the holiday hub-bub had died down that I became curious about name "Absente". A little research turned up the fact that Absente is made with Southern-Wormwood ("Petite Absinthe") instead of Wormwood. All the text on the bottle is in French. At the very top of the front label it reads: "Liqueur aux plantes d'absinthe". Also on the front label near the bottom, one of the ingredients is listed as "infusion et essences de plantes d'abinthe". Their web site states that Absente is legal in the U.S. because it does not contain Wormwood. I'm confused.... but I'm guessing that this stuff isn't absinthe. This time, we tried a clear, Swiss-style absinthe called Blanchette. 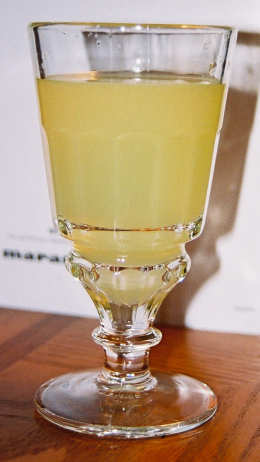 In general, absinthes can be either green or clear. Absinthe gets its natural green color because of a combination of the herbs used to make it and the very high (65% or more) alcohol content. Because of the high alcohol percentage, the green chlorophyll bits actually remain suspended in the elixir, only to be released when you add the water and sugar, a process known as "louching". 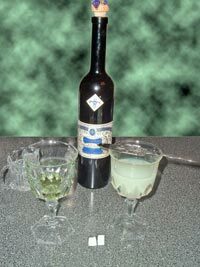 A clear absinthe, which has a milky white louche, is often a Swiss La Bleue absinthe. These are usually of a slightly lower alcohol level (55-60%) than a traditional French absinthe, which may account for its clear color, or perhaps a different recipe. In any case, T.A. Breaux, the New Orleans chemist mastermind behind Jade Liquors, has helped out Combier to produce Blanchette. It is the first clear absinthe we have tried here at InAbsinthia and we were looking forward to it, wondering what kind of spell a clear absinthe would cast. Upon twisting off the cork, a strong aroma of anise (licorice) assails the nose, loud and clear. 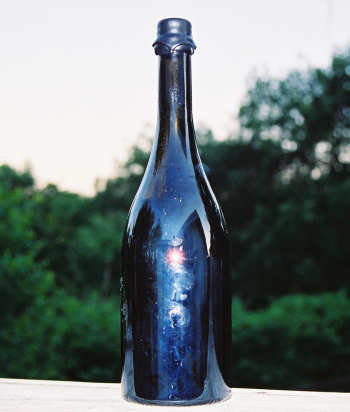 Blanchette does not have the hard wax sealed corked bottle Nouvelle-Orleans, but rather the plastic topped cork stopper as found on lower end port bottles. But the nose is definitely that of absinthe! We poured about 1.5 oz into each glass, put the absinthe spoon on top with two sugar cubes on it and began gently pouring in filtered, ice cold water. I shake it in my cocktail shaker filled with cracked ice, getting it nice and cold. Then I decant the water into a small glass pourer and we pour the water over the sugar cubes, trying to be as slow as possible. Someday, we'll have to get one of the fancy absinthe glasses with the little reservoir at the bottom, and the holder for the ice cubes at the top. But for now, we'll make due with fancy goblets and trying to be careful while pouring the water over the cubes. The louching action was pretty good, but subtle. It really just gradually clouded over, rather than the water showing up as droplets. The final result was a nice, cloudy drink, but without any pearly touches. Still with a powerful anise smell, though. The first sips were pretty good as well with, once again, a nearly overpowering taste of anise. There was really no room left for tasting too much else, which made the Blanchette very much a one trick pony. There weren't nearly as many interesting flavors as we found in Nouvelle-Orleans, just a full-bodied anise (licorice) taste. Which isn't necessarily a bad thing, and certainly not unexpected, given the aromas. So it was an enjoyable blanche absinthe, but lacking the subtleties of Nouvelle-Orleans. A nice twist on the original verte absinthe, and one that we will visit again in the future, I'm sure. We did another tasting of Absinthe Nouvelle-Orleans the other night and it once again impressed us with its smooth taste and excellent, tingly, finish. We used a slightly smaller amount of absinthe, but probably ended up with a slightly stronger mixture, as we added less water. We also used two suger cubes per glass, rather than the one we used last week. This made for a sweeter, more licorice flavor, and really made it go down smoothly. The color of the Absinthe Nouvelle-Orleans starts out a pretty pale green, almost the same color as the herbal liqueur Chartreuse except maybe a little greener. We trickled the cold ice water across the sugar cubes and into the absinthe much more slowly this time, using a small pourer. It takes a bit for it to "louche", which is what it is called when the absinthe turns into the cloudy green. You can see in the picture a before and after. Pretty neat transformation, actually. And then you just sip it. As mentioned, it tastes a little bit sweet, with a very anise/licorice flavor. Not really minty, although there is some other kind of herbal taste to it. While it starts out at nearly 140 proof (68% alchohol), by the time you drink it in this fashion, it has been cut down more than half. 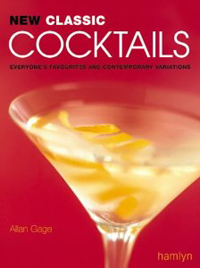 I imagine the resulting mixture is about 40-50 proof, so less than a good martini. And after a few sips, your tongue gets tingly. Not really like it feels as the novocaine wears off after a dentist visit, but much more subtle. You don't even notice it creep up on you. A really special apertif.